For Malaysian fans of the Yamaha YZF-R25, their affection for Yamaha’s quarter-litre sports bike cannot be denied, with many making mods to their steeds to suit personal taste. But if the normal run-of-the-mill modifications are not enough, GG Retrofitz, based in California, US, has something special on sale. 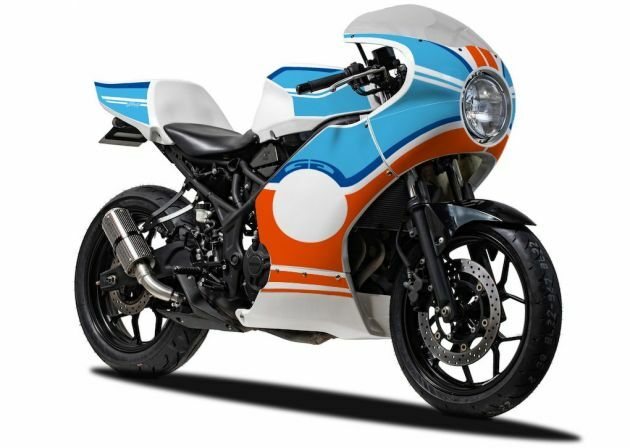 Costing USD 1,198 (RM5,000), GG Retrofitz makes makes bodywork for the R25 – the US gets the YZF-R3 – that makes it look like an old school Yamaha TZ. Since the firm ships internationally local R25 riders can avail themselves of this bodywork, though shipping and duties could likely double the cost of the kit. Inside the kit, the rider will find a four-piece full-fairing in the retro cafe racer style and a Zero Gravity windscreen originally designed for the 89-90/93-99 Yamaha FZR 600. Also included is body mounting hardware, fuel tank cover and rear cowl that closes off the pillion seat. No chassis modification is needed with the GG Retrofitz kit and the prospective R25 owner only has to source a suitably sized 7-inch diameter round headlight for which the firm can supply an optional H4 adaptor. Also needed are clip-on handlebars to properly clear the cut-outs in the fairing. According to GG Retrofitz, the kit lowers the weight of the YZF-R25 by 4 kg and there are optional sticker sets for the bodywork, priced from USD 258 (RM1,082) to USD 298 (RM1,250). The R25’s other equipment such as rear light, seat and mudguard are retained. The updated 2019 Yamaha YZF-R25 was recently launched in Jakarta, Indonesia, which uses the same 35.5 hp parallel-twin power plant but has 8/kmh faster top speed. In Malaysia, the 2018 Yamaha YZF-R25 retails at a price of RM19,463. Buy a set and make copy moulds here in malaysia. now that’s an good idea chief!